Please contact us if your gage is not listed above. Most surface texture gages produced today work quite well, however, many lack the graphics or all the computing power that you truly need. TrueSurf can make any gage capable of computing all the latest ASME and ISO parameters. 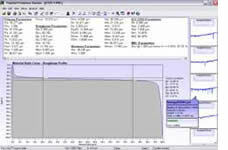 Enhance the capabilities of your instruments with TrueSurf software to visualize the profile data. You have the hardware that you need, now get the software that you really want. TrueSurf can provide the data visualization and analytical power that your gage may be missing. TrueSurf software will enhance your product line and at the same time free up more of your resources to handle your day to day production schedule. Ability to easily interface to nearly all makes and models of surface roughness equipment. Calculation of nearly all ASME, ISO, and DIN surface roughness parameters. Ability to load and analyze multiple profiles. Calculation of ISO 13565 parameters. Calculation and display of the unfiltered profile, roughness profile, waviness profile. Calculation and display of the material ratio curve and material ratio parameters. Gaussian, Valley Suppression. 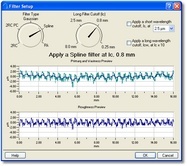 Spline, 2RC, and 2RC Phase Corrected filters. Cursor display for easy measurements of vertical and horizontal distances. Fast Fourier Transform (FFT) analysis to compute wavelength content. Hard-copy report generation that is compatible with any Windows printer. Adobe PDF document report generation. Ability to export any computed profile or curve data.